It was deja vu in the 2016 Kansas 6A State Championship game, as the Blue Valley Tigers faced off against the Derby Panthers at Emporia State University. A Blayton Tullis 21-yard field goal with 27 seconds left lifted the Panthers over Blue Valley for the second consecutive year, 17-14. As both teams traded punts and turnovers in the fourth quarter Derby junior back Brody Kooser fielded a punt at his 41 and broke off his best return of the day all the way to the Tigers’ 34 yard-line. The Panthers took over with four minutes remaining and the score tied at 14. Kooser had four rushes for 18 yards and was crucial in getting the Panthers down to the four yard-line setting up the game winning field goal. Blue Valley’s defense held strong keeping the potent Derby out of the end zone most of the game. The Tigers forced two turnovers on the day and had numerous pass breakups. Blue Valley’s offense was never quite able to get going. The Tigers were held to only 4 yards rushing. Senior running back William Evans could be seen on the exercise bike between possessions trying to stay loose. 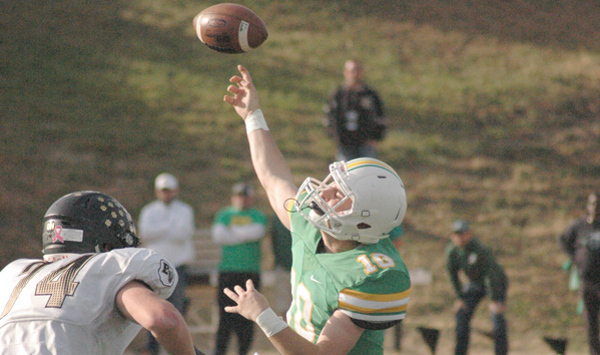 Quarterback Matthew Dercher was pressured into three interceptions and one fumble on the day. A bright spot for the Tigers came as the first half was coming to a close. After driving 40 yards in 30 seconds Blue Valley found themselves on Derby’s 32 yard line with just five seconds remaining. Dercher took the snap, rolled to his right and threw the ball back toward the front left pylon where senior wideout Harrison Van Dyne was running. Van Dyne out jumped the smaller defensive back and took the ball right out of his hands. The 32-yard touchdown put the Tigers up 14-6 going into the half. Despite losing in the final for the second straight year, Driskell still feels this was a successful season for the Tigers. RUSHING: Blue Valley: William Evans 10-17, Totta 4-3, Gus Gomez 1-(-2), Van Dyne 1-(-3). Derby: Brody Kooser 31-139, Dawdy 4-(-13). PASSING: Blue Valley: Dercher 24-48-3, 225. Derby: Dawdy 19-38-1, 224. RECEIVING: Blue Valley: Van Dyne 7-92, Gomez 7-52, Brown 4-36, Green 4-35. Derby. Tabor 9-129, Littleton 9-91, Kooser 1-4.